I always felt that Shakin’ Stevens was kind of a British equivalent of a young Elvis Presley. With his greased quiff hair style, denim jeans and jacket and those crazy dance steps, Shaky, as he was nicknamed, had that kind of an air about him. The style of songs he sang also had an element of The King about them too, being good old fashioned Rock ‘n’ Roll, with a real emphasis on the Roll. He had a string of hits which are still popular today. Like The Birdie Song they are a mainstay of Wedding DJ’s, but unlike The Birdie Song fond memories come to peoples minds when they are played, rather than “Oh no, not that one”. His real name is Michael Barrett, and he was born in Ely, Cardiff in Wales, so we could call him the Welsh Elvis! There are two songs for which he’ll always be remembered, and it’s hard to choose which one epitomises him most. One of them has to come first though, so I think I’ll have to go for Green Door, although This Ole House isn’t far behind. I’m sure everybody remembers the chorus to both these songs, and watching Shaky prancing about and do that jump in the air and landing on his toes with his knees bent inwards. Green Door is a song which jumps between being calm and inquisitive (What’s behind the Green Door?) to lively and fast paced (There’s an old piano and it’s playing hot). This Ole House on the other hand is a good example of what I mean about him being like Elvis, as it reminds me a lot of Elvis numbers such as Hound Dog or Jailhouse Rock, which move along at a relatively fast rate with barely a pause for breath. Those weren’t his only hits though, in fact he has quite a list, including Oh Julie, What Do You Want To Make Those Eyes At Me For, Cry Just A Little Bit, and the suitably jingly Christmas hit, Merry Christmas Everyone. I suppose there was also an element of Cliff Richard about Shaky, although the Cliff from the Summer Holiday era rather than the later Tennis playing turkey necked Cliff. 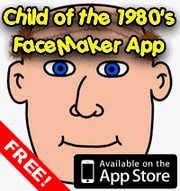 Indeed I seem to recall in the video for the Comic Relief song Living Doll with Cliff and The Young Ones, Vyvian mistook Cliff for Shakin’ Stevens. Shaky is still active today, and released a new album called Now Listen in May 2007. 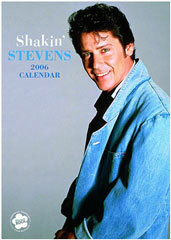 For more things Shaky based, check out the Official Shakin’ Stevens website. This entry is filed under Music - Artists	and was posted on November 28th, 2007. You can follow any responses to this entry through the RSS 2.0 feed. You can leave a response, or trackback from your own site. I believe Orfelina is saying they have been a big fan of Shakin’ Stevens since the 1980’s, and that they saw him in concert in 1983 in Chile. Whilst searching the internet orfelina came across this post, and is pleased Shaky was big in the UK. Orfelina looooooooooves Shaky! More Shaky news! Apparently he is to be one of the acts at the Glastonbury festival this year, so if you don’t mind mud and living in a tent for a weekend then this might be a good opportunity to see him live. Marc crookes would like to announce even though he is a proud Cardiff lad, he is not or never has been a shaking stevens. As for coming out there are plenty who will know that is totaly unbelieveable!!! …but which is the real one?